entire night lost to storm. nearly 100 km/h winds at one point and about 2 cm of snow by midnight. lost entire night to another front. temps dropping below freezing with 70+ km/h winds and 95+% humidity. brrr!!! entire night lost to a cold front that swept in during the afternoon. fog, high wind, and even a few snow flakes. took some QTH flats and biases that i didn't get around to doing last night. After the science workshop, the participants were invited to the Palace Demesne for a reception with the mayor of Armagh. We were all personally greeted by the mayor as we entered the Palace for the reception. Mark Bailey, our host at Armagh Observatory, gave a very stirring welcome about SALT and the impact that astronomy has on the development of modern society, not only in South Africa but for all the SALT partners. Ellen Nordsieck, a frequent blog-follower, is happy to be re-united with Ken Nordsieck, after his long commissioning run of RSS in Sutherland. Christian Hettlage (middle) meets with Aswin Sekhar and Shengu Yu, two graduate students working at Armagh Observatory. The full SALT board along with the mayor of Armagh and the Minister of Arts, Culture, and Leisure. otherwise mostly clear night lost to high humidity. >90% almost the entire night. faffed around with Fabry-Perot to check calibration stability and for self-edification. The beautiful face on spiral galaxy NGC 5364 is shown above in a false-colour optical image. The extensive spiral arm structure is clearly visible, winding around the central galaxy bulge. The bright coloured spots within the spiral arms indicate the positions of HII regions which are areas of large (some can be several hundred light years across!) clouds of ionized gas associated with intense star formation. The galaxy is located in the Virgo cluster around 70 million light years from Earth (redshift of 0.004) from us. NGC 5364 was observed using the RSS on SALT in Fabry-Perot mode on 11th May 2011. A succession of 60s images scanning across the H-alpha (6563A) emission line were taken and three of those images were combined to produce the colour picture above. 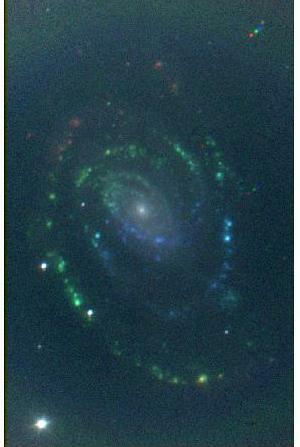 The colours shown provide a sense of the rotation of the spiral arms. Blue colours show regions that are moving towards us (the peak of the line emission is blueshifted relative to its rest wavelength) and red colours show regions that are moving away from us (the emission is redshifted). Foreground stars are visible in white in the image, and if you look carefully you can spot the Fabry-Perot ghost of the bright star on the bottom left of the image. The ghost is situated at the top right of the image. As a consequence of not auto-guiding during these observations, the position of the ghost is slightly different in each individual image frame used to produce the resultant colour image and therefore the three constituent colours are clearly separated in the final picture. On Tuesday, we had a series of presentation on some of the early results from the commissioning of the science instruments. First, David Buckley presented the overall status of SALT and the commissioning of various sub-systems. Even though not all the sub-systems are fully commissioned yet and the telescope will become more efficient with refinement of these systems, the main result is that SALT is back and producing science again. Next up was Darragh O'Donoghue presenting imaging results from SALTICAM and the newly realigned SAC. The before and after images are really astonishing. Here, we can see Darragh presenting some slotmode observations for Marissa Kotze that is looking at X-ray binaries. Early RSS results were produced by Ken Nordsieck and Ted Williams. RSS is a multi-mode spectrograph and they have already tried out many of those modes including long slit, spectra-polarimetry, Fabry-Perot, and slotmode observations. The UV throughput looks good although more testing is needed before claiming the fix a complete success. Here is an example of some spectra of OB stars reduced by Alexei Kniazev for his proposal. Finally, Mike Shara presented some early results of the SALT consortium project investigation into the bursting nova T Pyx. This has already led to the astronomical telegram, but SALT has continued to regularly monitor the object since its outburst. If you are interested in more details about these observations and in participating in the project, please contact Mike or see the T Pyx commissioning wiki. In addition, the status of the pipeline software and the proposal tools were presented by Steve Crawford and Christian Hettlage. Look for future posts on these subjects or contact us if you are interesting in arranging a tutorial. Overall, it was a great first science workshop and we look forward to the next one in Cape Town where hopefully there will be even more results to present! Thank you Armagh for hosting! The participants in the SALT science workshop before the board meeting at Armagh Observatory. entire night lost to bad weather. fog/rain/drizzle/etc. took some closed-dome engineering data to check RSS CCD gains. - Cold front moved in earlier today. Had sleet and a little bit of snow tonight. Temperatures were below 2 for most of the night. With the 29th SALT board occurring this week at beautiful Armagh Observatory this week, a planned 'Science with SALT' workshop was included in the meetings agenda. Today, members of the commissioning teams along with other SALT partners are presenting science results from the newly re-commissioned SALT. I'll try to add some updates during the meeting and add the talks as they are uploaded. Updated: PDFs for all of the talks have been added. - Bad weather. Did not open. - Some work was done on BVIT tonight. - Cloudy and strong winds prevented us from opening tonight. NGC 6781 (top) is a planetary nebula (PN) in the constellation of Aquila. The main ring measures approximately 2 arcminutes in diameter and is about 1 kpc distant. The true 3D geometry of a PN cannot usually be grasped from images alone and studies have indeed shown that NGC 6781 is a toroidal shell (bottom, Schwarz & Monteiro 2006) typical of so-called bipolar nebulae. If you look carefully you can make out numerous filaments of dust which are responsible for the patchy reddening observed in this nebula. 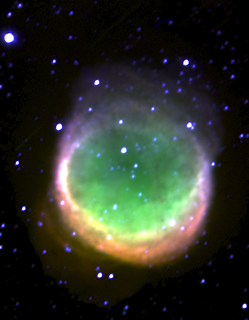 NGC 6781 was observed on 10 May 2011 with RSS in Fabry-Perot mode which scanned through the emission lines Halpha 6563 (green), [NII] 6583 (including HeI 6678, red) and [SII] 6730 (blue). The ionising central star is best shown at bluer wavelengths (see here). Credit: Observers were Ted Williams, David Buckley, Brent Miszalski (processing and write-up), John Chisholm and Nicola Loaring. - Increasing wind speed forced us to close just before 02:00. NGC5750 is barred lenticular with narrow-line AGN. The most prominent features of NGC 5750 is ring and several intricate dust lanes. 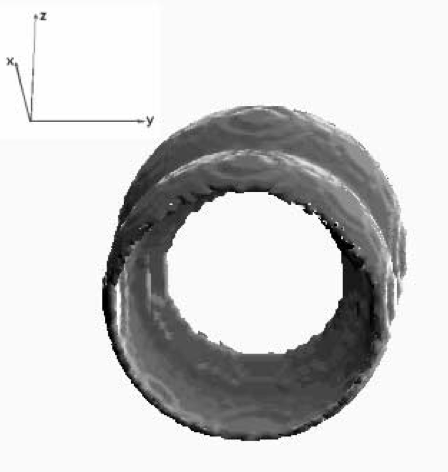 A weak bar is surrounded by the ring. The ring is broken at severally places which gives the impression of tightly overlapping spiral arms starting at opposite ends of the bar. NGC 5750 was observed on 10th May with SALTICAM in B,V, R and Halpha filters with 15 second exposure time in each filter. Credit: Observations made by David Buckley and Petri Vaisanen and color image and write-up by Sudhanshu Barway. - Cloudy all night, did not open. * More work done on sorting out guiding for the RSS. * Science observations done for Knaizev, 2010-1-RSA_UKSC_OTH-013. * Closed just after 3 due to high humidity. * Was a successful night with plenty of data. - Another bright but clear night, used for various engineering and science commissioning tasks (data for UKSC and POL programs). Lost last 3h to humidity - first time for more than a week. - First use of RSS slotmode (though without the slotmask), 1 Hz spectroscopy on T Pyx. T Pyx again, commissioning for far red sky task, and several bright galaxy spectra for a commissioning science RSA_OTH_IUCAA proposal and bright stars for an RSA_OTH proposal. - Spent time getting guidance mapped out with Janus and testing new tool for it. - T Pyx data with offset slits for scattered light. - Salticam to RSS field position mapping sequences done. Finland is the Ice Hockey World Champion !!! Others: Tim, Eric, Marsha, Steve P.
- A productive night with excellent conditions once again. Etalons not available for the night. extreme red settings and massively multiplex spectroscopy. acquisitions and guiding in general. Over the last year, we have started to provide site monitoring information for Sutherland. In addition to the normal weather information that has always been provided by SALT, we are now publishing information about the seeing conditions in Sutherland. This project has been on-going for quite sometime, but it has really taken off due to the hard work of SALT astronomer Tim Pickering and Laure Catala, a NASSP masters student. We are now measuring the seeing conditions ever night that SALT is open and publishing the results online. The two main instruments are timDIMM and MASS. The MASS (Multi-Aperture Scintillation Sensor) instrument was purchased from CTIO based on the designs from The MASS Group. The timDIMM instrument is a Differential Image Motion Monitor built by Tim Pickering to work with the MASS instrument enclosure. Combined, the two instruments provide integrated and differential measurements of the seeing. On the seeing page, we provide information about the integrated seeing provided by the DIMM measurements, the free seeing provided by the MASS measurements, and the Cn2 profile. In addition, all data that have been produced are also available at that website. - Another very stable-weather night after an initial RH jump. - Windowed fast spectroscopy of T Pyx at Ha. with even 0.5" DIMM periodically seeing. - Unfortunately lost most of the night due to a tracker gear-box failure. The fix by tech.ops will be installed during the day. - Succesfull UV T Pyx spectropolarimetry just before that. - Lots of F-P calibrations - burned out a Ne lamp in the process. Others: Janus, Tim, Ted, John, Eric, Marsha, Steve P.
targets and first succesful spectropolarimetry with T Pyx. and rss images, and also variation when putting fold-mirror in/our. was hunted down. Needs more work to map. which features a cool surprise visitor caught on camera! After years of woe and frustration trying to get our CONCAM all-sky imaging system to work satisfactorily without much success we finally said "enough!" and purchased a replacement. The new camera is an SBIG AllSky-340 which comes fully integrated into a weather-tight enclosure and includes all the software required for automated operation. Unfortunately, that software proved to be buggy and doesn't get along well with Windows 7. The software for talking directly to the camera does work fine, however, we were able to acquire images manually. Here is an example of a 120-second exposure from the camera's temporary home in the ox wagon. The MASS-DIMM telescope is to the right, the MONET building in the upper right, and the roof of the ox wagon is covering the left third of the image. A excellent productive night, photometric with seeing varying from 1-2". More SALTICAM commissioning of globular cluster CMDs. Nice SALTICAM images of NGC5750. Tim successfully tried out the new all-sky camera in the ox wagon. * Excellent night, after a long wait! * SALTICAM globular cluster CMD obs. Others: Ken, Ted, Nic, John, Marsha, Brent, Eric... and Jack. - Clearing at sunset, but RH increased and eventually had to close early (@ ~20:30), so no on-sky observations. - Clouded out tonight. Ted got more Fabry-Perot engineering data. successful. We now have guiding for the RSS. - Welcome to the Fabry-Perot team from Wisconsin! - Clear night with fair to bad seeing. Observations all night!